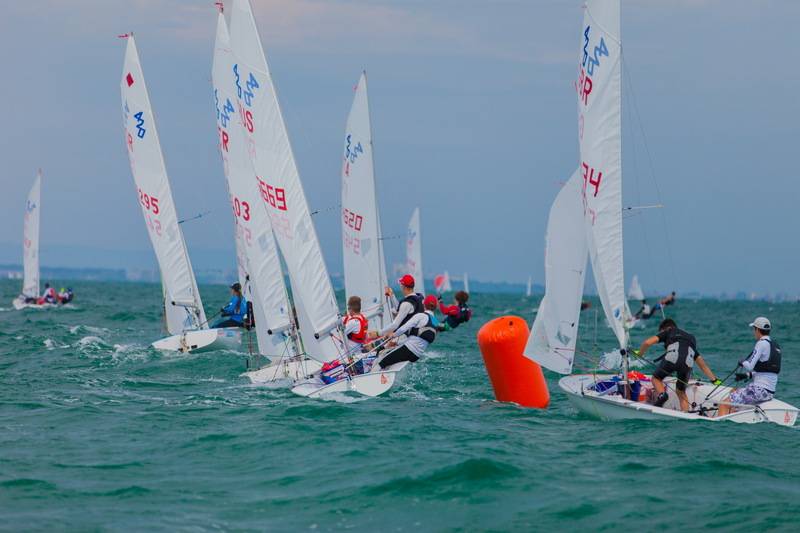 Race day 2 at the 420 and 470 Junior Europeans saw an increase in breeze out on the two race courses off Bourgas, Bulgaria. Two races for the 420 Open and Under 17 fleets and three for the 470 gives a shake-up to the leaderboard as the early hierarchy starts to become established. The 470 Men have finished their 5-race qualification series, while the 470 Women continue a single-series. In the 420 Open, gold and silver fleets will be decided after tomorrow’s 2 races, with the 420 U17 fleet sailing a single series. Matteo Capurro/Matteo Puppo (ITA) climbed from 8th to 1st with a three race score of 2,3,1 and the discard kicking their 10th place from race 2 off their scoreline. Holding a world ranking of #37, this long term partnership is intent on claiming their first podium finish at a Junior Europeans. They were close in 2013, leading early in the Championship series, before mast breakage forced them off the race track, ruining any hope of a medal finish. In 2014, Capurro was too old to compete at the age-restricted Junior European Championship, but returns to the race track in 2015 as the age limit increased to 23 years and under to support the transition to 470 senior fleet racing. 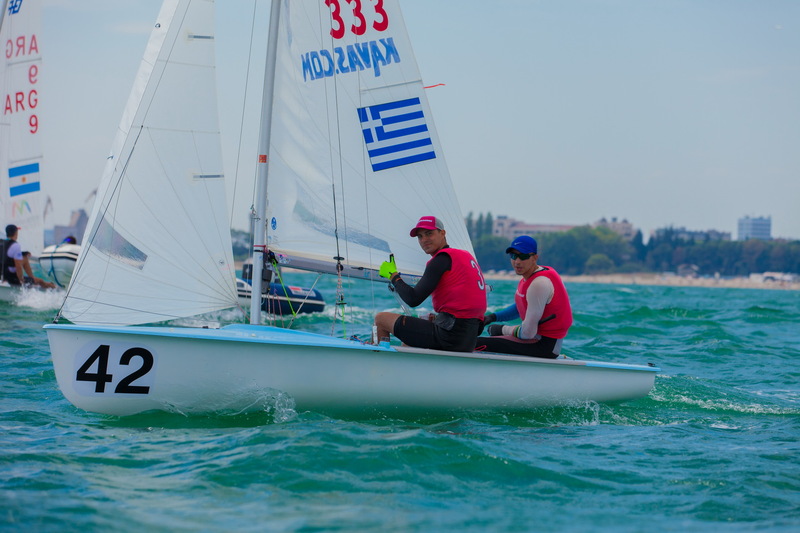 A new partnership making a first time appearance at a 470 Championship are Alexandros Kavvas/Akylas Drougkas (GRE), who ended day 2 in second overall. The pair has racked up many years of experience separately, and from their form so far it would be difficult to guess they teamed up just a few days ahead of the Junior Europeans. Racing with his brother, Alexandros won the 2012 420 Worlds, before stepping up to the 470 Class. Another pair who made their mark in the 420 before transferring to the 470 are twin brothers David and Alex Charles from Spain, who sit in third overall. In the same year Alex Kavvas claimed 420 Class gold, the Charles brothers secured 420 World Championship bronze medals, and won the ISAF Youth Worlds. 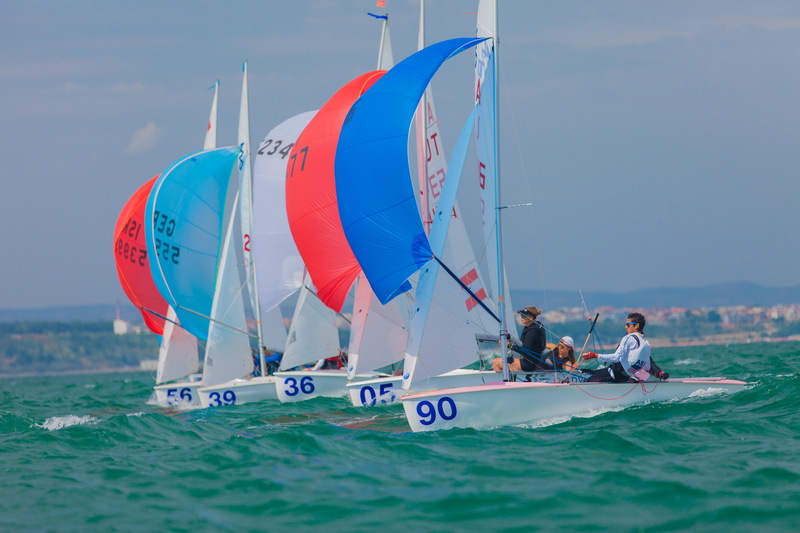 A different class to master, rewards in the 470 have been harder to come by, but still include a bronze medal at the 2014 Junior Europeans. For the future, the brothers have their sights on the Tokyo 2020 Olympic Games. The 470 Men fleet is now split into gold and silver groups for the 6-race final race, leading up to the top 10 medal race on Saturday 15 August. Another ISAF Youth Worlds Champion in the 420 Class who has stepped up to the 470 is the current leader of the 470 women Silvia Mas of Spain and her crew Paula Barcelo. 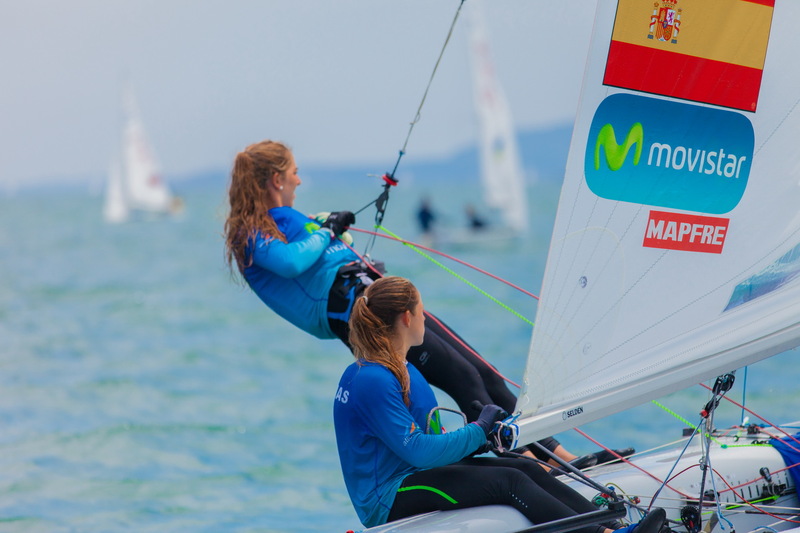 Mas won ISAF Youth Worlds gold with former crew Marta Davila in 2014, and interestingly Davila won the 2015 420 Worlds at the end of July with her new helm Marta Garrido. Three races for the fleet today, and the series discard came into play after race 3, changing the shape of the leaderboard. An up and down series so far for all teams with front of fleet scores sitting alongside double digit results. All teams are already counting a discard score, so races need to start being more consistent to take the advantage. Second overall to Roberta Caputo/Alice Sinno (ITA) and third to Bàrbara Cornudella Ravetllat/Sara López Ravetllat (ESP). 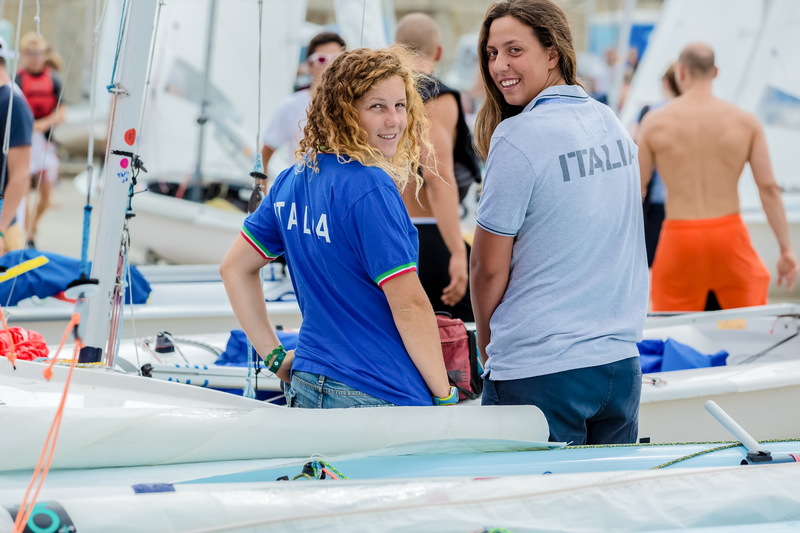 Italians Benedetta Di Salle/Alessandra Dubbini won the 470 Women Junior Worlds last week and currently sit in 5th place. Although, their 11th place in the final race of the day is discarded, their gap to the top of the leaderboard has increased to 13 points. 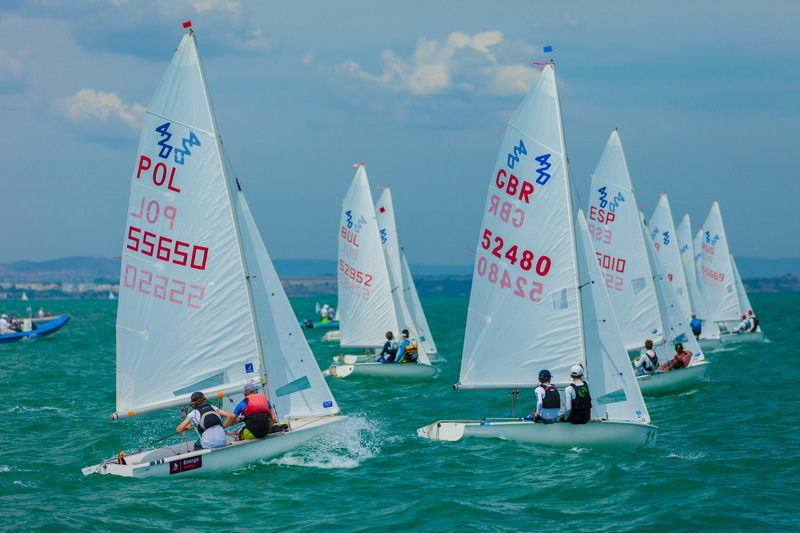 Game plan for the 470 Junior Europeans is to improve their overall capacity. The pair are up against all the silver and bronze medallists from the 470 Junior Worlds, along with a fleet full of young talent. The 470 Women are is racing a single 11-race series, with the top 10 advancing to the Medal Race on Saturday 15 August. Two races will be contested on Wednesday 12 August. Three wins from four races puts the USA’s Wiley Rogers/Jack Parkin in a class of their own so far at the 420 Junior European Championships. Fresh off the back of a silver medal haul at the 420 Worlds in Japan on 25 July, the team has kept their momentum and focus. Split into two groups, the 90 boat 420 Open fleet will race two more qualification races tomorrow before being split into gold and silver for the 6-race final series. An all top 5 scoreline to Nita Hasson/Tal Harari (ISR) keeps them in second, with Souzana-Ioli Bakatsia/Nikoletta Efstathia Papageo (GRE) in third overall and top girls’ team. The partnership is new for 2015, but with eight years’ 420 Class racing experience between and their results on the board so far, already look to be a winning combination. Leaderboard shuffles will be plenty tomorrow, when the series discard kicks in after race 5. Gainers will include Marc Llado/Javier Gonzalez (ESP) who, despite winning race 4, languish back in the pack in 33rd overall, but are set to bounce back to the front once they discard their UFD penalty from race 3. 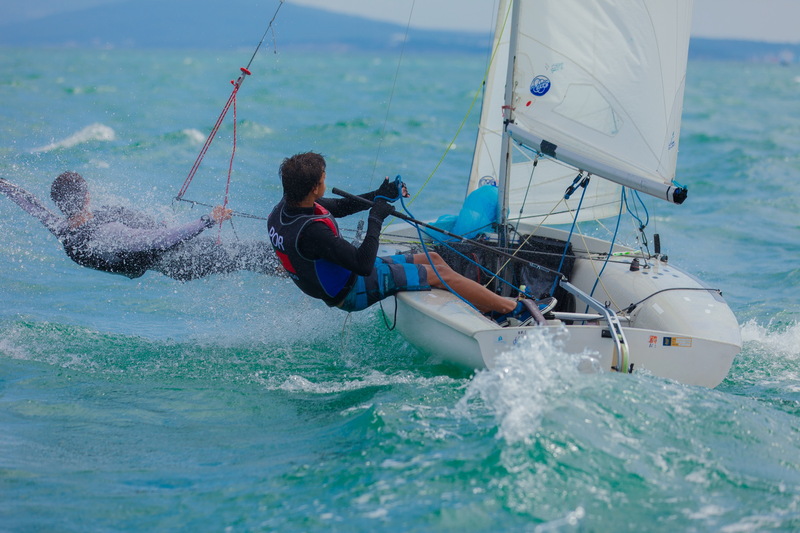 The pair won the silver fleet at the 420 Worlds, but will expect to be higher up the pack at the Junior Europeans. 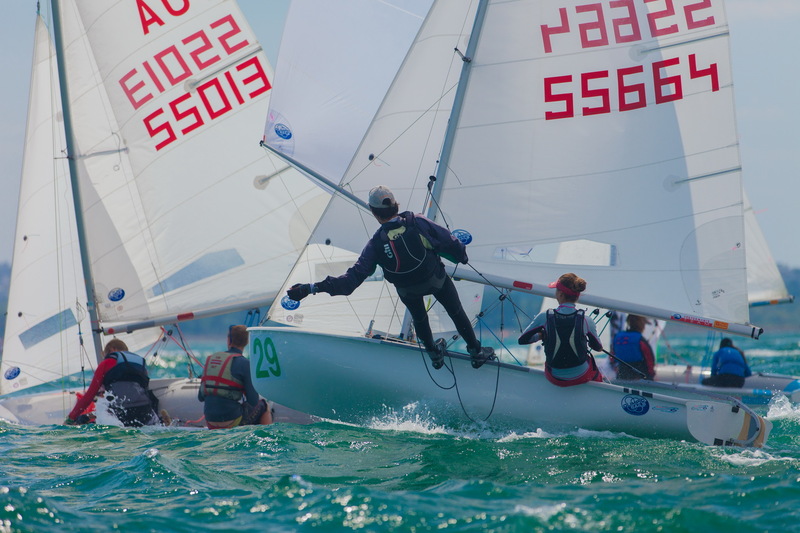 Lying in 45th overall, Switzerland’s Nicolas Rolaz/Erwan Lamour are sitting on the cusp of the cut-off point to determine the top 45 teams advancing to gold fleet. Rolaz is the 2014 Optimist World Champion, and teamed up in the 420 with his long-term Optimist sailing partner Lamour literally the weekend after winning gold last year. “I was really happy with gold and now I want to do the same in the 420,” smiled Rolaz, brimming with confidence. The team has set themselves a target of two years to rise to the top of the 420 fleet and are on a mission to win the 420 World Championships in this timeframe. The pair has also been selected to represent their nation at the ISAF Youth Sailing World Championships in Malaysia in December 2015. For today, the focus will be on both defending their leaderboard position and hopefully advancing to be well inside the gold fleet cut from the day’s two races. 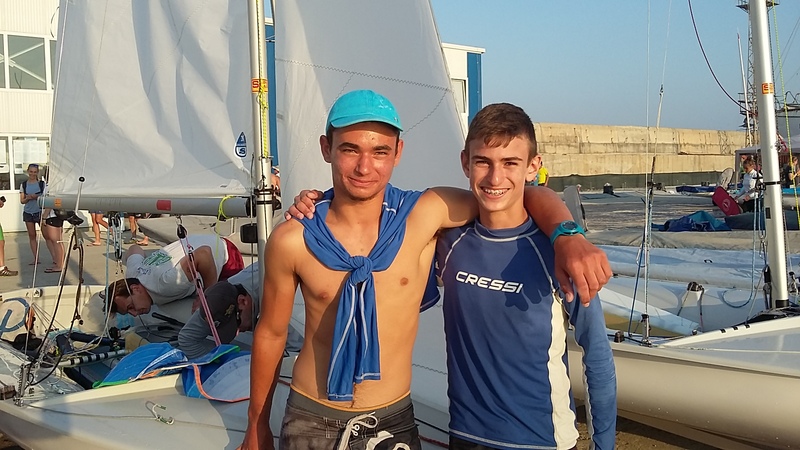 At the 2014 420 Worlds, Ido Bilik/Ofek Shalgi (ISR) not only won the bronze medals, but were also awarded the William Sanchez Trophy as the highest placed team aged 16 and under in the year of the Championship. Rock forward one year and the team, still both only 15 years old, are thriving in the opportunity to race against their own age group in the new under-17 year old category. A 1,2 today places them 5 points above the Spanish brother partnership of Carlos Balaguer/Ignacio Balaguer, with Italy’s Andrea Spagnolli/Kevin Rio in third. Top placed girls team are Theresa Loffler/Theresa Heilingbrunner (GER) in 5th overall. The 420 U17 fleet is racing a single 12-race series, with 2 races scheduled on Wednesday 12 August. 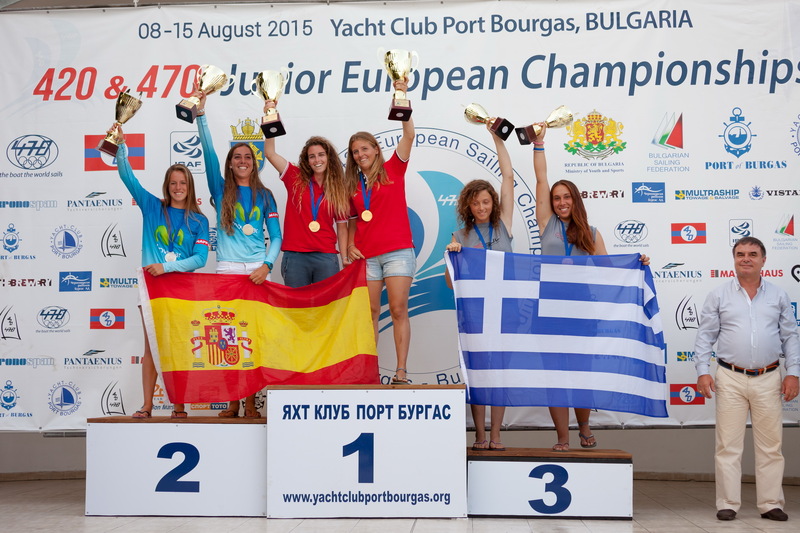 The 2015 420 and 470 Junior European Championships, 8-15 August 2015, are organized by Yacht Club Port Bourgas, in co-operation with the Bulgarian 420 & 470 National Class Association, the International 420 Class Association, the International 470 Class Association, the Municipality of Bourgas, the Port of Bourgas and under the auspices of the Bulgarian Sailing Federation. 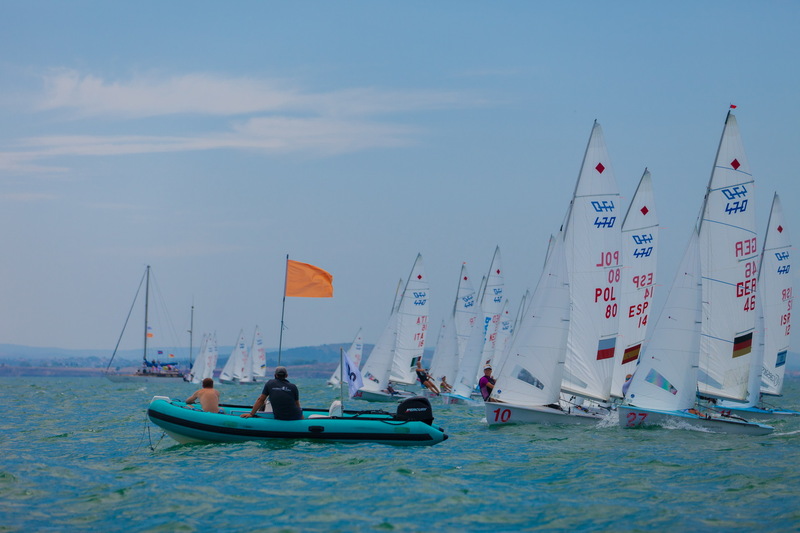 412 sailors from 30 nations are competing, with 90 boats in the 420 Open fleet, 34 teams in the U17 420 fleet, 33 teams in the 470 Women and 51 teams in the 470 Men. The 420 Open fleet will contest a 12 race series, with 6 races in the qualification series and 6 in the final, with a single race discard coming into play after race five. The 420 U17 fleet will contest a 12 races single series. The 470 Men fleet contest a qualification series of 5 races, a final series of 6 races and the top 10 advancing to the Medal Race on Saturday 15 August. The 470 Women contest an 11 races single series, with the top 10 advancing to the Medal Race on Saturday 15 August.